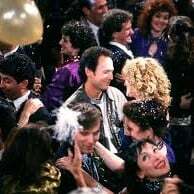 I know there’s more than one movie associated with New Year’s Eve than When Harry Met Sally, but at the moment I can’t think of anything better. And on a re-watch, it still stands up beautifully through time. Ever meet someone you can’t stand at one point in your life, but grow on you through time? That’s kind of the lovely premise at work between Harry and Sally. It happens with movies too. All the time, especially in the business of RunPee (we’ve seen around 1500 movies over the last ten years): I’ll see something I wasn’t impressed with, then it will come around my radar later, and I’ll be surprised at how good that film really is. Sometimes it’s something nuts, like Monty Python’s Holy Grail (once I memorized the lines, things took on a whole new world of fun), or something with action or sci-fi (like Pacific Rim or Independence Day). [pullquote]Sometimes I’m too young to appreciate a great movie, like I finally noticed on this year’s rewatch of Jaws and Rocky. If you haven’t seen those in a while, give them another watch. [/pullquote] There are moments in each that are pure gold, never completely replicated since. But it’s New Year’s Eve, so back to Harry & Sally. They took most of a lifetime to become ready for each other. Their enmity was almost instant as they left college to begin their adult lives. [pullquote position=”right”]They kept bumping into each other, with a visceral reaction every time. That should have told them something right there. Even bad chemistry is chemistry. [/pullquote] Eventually they worked it into friendship, then screwed that up because the timing with people is rarely right, and finally we’ve got the scene at the very end with Harry tearing across New York City to be there for his obvious life partner before the clock hits midnight. I always tear up a bit at the end. Those crazy kids. I love the bookend ‘interviews’ with the couples. It’s a sweet little film. If you’re not heading out on the town to drink and dance (and hopefully not drive), consider sticking When Harry Met Sally back in the DVD player. We’re running a poll on Best New Year’s Eve movies on Twitter right now. Get your vote in this week, or wait to see how the results turn out. And to you and your family, have a safe and joyous New Year! Auld Lang Syne — whatever that means. Sally tells us it’s something about old friends. Awwwww. saw this film once and hated it, twice and thought, maybe it’s not so bad and a third time and I was hooked! Steve, I get it. Movies change as the course of our lives change, and the ages of our experience deepens. I am glad those two crazy kids finally found each other. And I do NOT want to see a sequel o r a remake.